We interrupt this bawdy bratwurst celebration to return to the reality of the Bulls season, which continued to break down Saturday in a 99-77 home loss to the Toronto Raptors. That made it 10 losses in the last 13 games, basically since the start of the Western Conference trip when the Bulls lost Derrick Rose for the season. The Bulls have had a few moments in the last four weeks with a blowout victory in Detroit, the Miami rout back home and Friday’s banked in game winning three in Milwaukee by Mike Dunleavy. But otherwise it’s been losses to teams with the poorest records in the NBA and dreadful offense, as bad as there is in the NBA of late with four of the last five games scoring fewer than 80 points all on below 40 percent shooting as the Bulls have failed to reach even an unacceptable level like 40 percent in nine of the last 14 games. It’s been the team’s poorest stretch by far since Tom Thibodeau became coach for the 2010-11 season. The Bulls record fell to 9-13. But the last four losses to Toronto, Milwaukee, New York and Detroit are to teams with a combined record of 32-61. Luol Deng, Jimmy Butler and Joakim Noah are back from injuries, though Kirk Hinrich went out Saturday for the first time all season with a sore back. And even though the Bulls trailed by just four points early in the fourth quarter, over the last 11 minutes the Raptors overwhelmed the Bulls and outscored them 26-8. The Bulls would shoot 21 percent in the fourth quarter, and, yes, it was the fourth game in five nights. But this has been going on now much too long to be just one of those schedule losses. The Raptors had played in a foreign country Friday night before flying to Chicago. The Bulls took the 20-minute flight home from Milwaukee. So, predictably, as ebullient as Joakim Noah was after Friday’s stunning reversal of late fortune, that’s how concerned Noah seemed Saturday about potential leaks in the Bulls previously strong foundation. Call that the team meeting. It’s a long season, which can mean a lot more nights like this other than a chance to rescue their season. That’s the test of any team’s character, how you respond not only to defeat, but when you believe you’ve done all you can and then you still cannot change the outcome. This Bulls team during the Thibodeau era has been defined by its character and unwillingness to yield to misfortune. They’ve prevailed so effectively and impressively that they have become in many respects a model for many NBA teams. But you also have to battle human nature. There are rumors of trades, of changes, of chances for glory gone. Thus Noah raised the question. Will they respond as well as they have in the games when they have been challenged? Because these are perhaps larger mental than physical challenges. They are a prideful and competitive group. They’ve shown that many times. There’s no need to question that. But they’ve never been through anything like this. And there isn’t much letup with a road trip to two of the league’s best teams, Houston and Oklahoma City, next week. And then it’s the tipoff game Christmas Day in Brooklyn. No one wants to be embarrassed on the big screen as well. 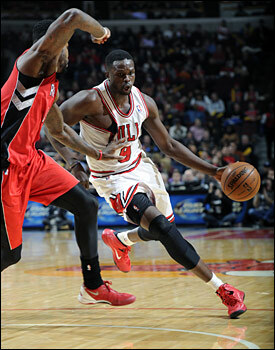 Deng in his return from an Achilles problem led the Bulls with 17 points, though 15 in the first half. He shot one of nine in the second half. Mike Dunleavy added 14 points off the bench, though was one of six on threes. Noah had 10 points and 12 rebounds and Jimmy Butler had 11 points. It’s been a brutal stretch, perhaps his worst as a Bull, for Carlos Boozer with eight points on four of 18 shooting. Boozer continues to be unable to finish at the basket and is leaving tips and put backs short. Over the last nine games, he is shooting 36 percent and that includes 10 of 17 for 27 points in the win over Miami. Take out that game and he is averaging 11.3 points the last nine. But Taj Gibson also has cooled off from his hot stretch of a few weeks ago and is averaging eight points on 40 percent shooting the last four games. The Bulls also had perhaps the one injury that could most not afford with Rose out. Marquis Teague started for Hinrich with D.J. Augustin in his second day with the team playing 20 minutes in relief. Teague’s seven points equaled his second most of the season. And he finished two drives at the basket. But he is a poor shooter and thus the defense against the Bulls continues to collapse into the lane, thus clogging up the penetration when the Bulls, as again Saturday, failed to find anyone with an accurate long shooting feel. “We missed a lot of shots,” agreed Thibodeau. “But I thought we were still in striking distance. I don’t want to use four out of five nights as an excuse; we have to do better. Sometimes that happens to a team, though rarely has it happened with these Bulls. Yet it’s also too much of a physical and mental demand to constantly have to play a perfect defensive game to have a chance to win. Mostly even in this poor stretch the players have been aggressive on defense, going over screens, trying to get out to the three-point shooters, contesting shots. But it’s only natural to expect some reward with scoring, and it’s been very difficult to match. 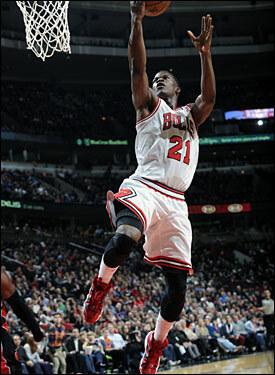 Jimmy Butler scored 11 points, but Chicago fell to 9-13 on the season. “It was an emotional win last night,” said Dunleavy, who had that game winner. “Bouncing back tonight we just didn’t play our best. That’s for sure. At no point in the game were we really playing well. I thought we hung in there until the last few minutes, but it’s just disappointing. They seemed pretty pooped from the beginning and never led in the game. They weren’t that far behind until into the fourth quarter. But the Bulls never made that supposedly inevitable NBA run and simply settled too much for jumpers. Deng got off to a fast start with nine first quarter points after missing the last four games. But the Raptors play much more smoothly and unselfishly without the traded Rudy Gay. They’ve won three of four since then to tie the Bulls at 9-13. And they seem to be trying to rebuild. There are rumors they’ll trade starting point guard Kyle Lowry next. Lowry led them with 16 points and center Jonas Valanciunas, seeing the ball since Gay was traded, had 15 points and 11 rebounds. DeMar DeRozan, no longer fighting Gay for shots, had a strong 15 points, seven rebounds and four assists. Overall, the Raptors had a season best 26 assists while also outrebounding the Bulls. The Bulls fell behind 51-41 at halftime as turnovers continued to plague them, this time the Raptors with 18 points off them. The Bulls are an unselfish bunch with good passers. But again with so little good spacing against a crowded middle they’ve continued to have interior passes picked off. Plus, they continue to run through long offensive sequences, thus taking a lot of shots late in the shot clock, which are thus forced. The Raptors went up as much as 16 in the third quarter, though the Bulls shaved it down to 73-66 as Teague banked in a three to close the third. Teague also had three blocks in an active game. The Bulls opened the fourth with Augustin’s first basket as a Bull after seven misses, a three, to cut the Toronto lead to 73-69. But the Bulls then missed the next six straight, four within five feet, and the Raptors were off to a double digit lead which quickly became a blowout loss for the Bulls. Perhaps it was fatigue. The Bulls didn’t much get to the foul line, just five free throws for the starters. No starter had more than four assists and the long distance shooters, Dunleavy and Augustin, were a combined two of 11 on threes. “We’ve got to do a better job of scoring the ball,” said Noah. “Our spacing wasn’t very good today. Our effort was good in spurts; not throughout the game and not what it has to be to win a basketball game. That was disappointing. We don’t say that too much. It sounded more hope than promise.